When I get a sore throat, I always find a cup of tea with some honey very soothing. But thanks to my proper Western scientific conditioning, I always assumed that the restorative power of honey was mostly in my head. Sure, it tastes good and has a pleasant texture that coats my irritated throat, but it’s practically pure sugar, after all. What good could it possibly do me other than diminishing my perception of discomfort for a few minutes? So for years I was content in my belief that honey is little more than a tasty placebo. Now, ironically enough, my convictions are being challenged, as researchers are turning up new evidence of honey’s medical benefits left and right. Honey’s salutary effects stem primarily from its antimicrobial properties. 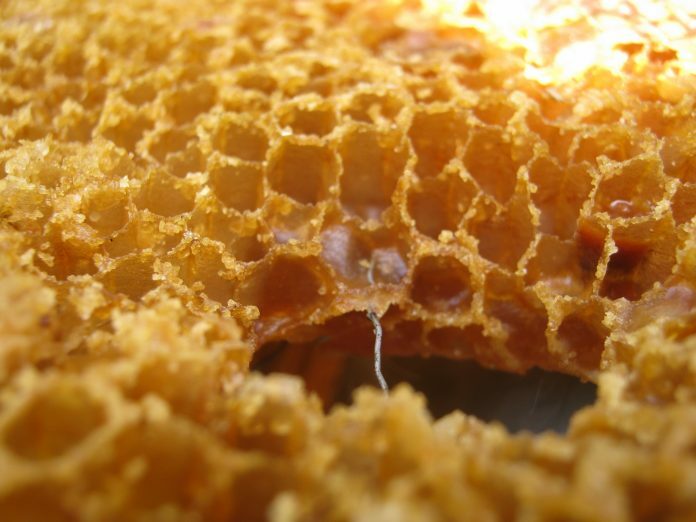 Most bacteria and other microorganisms cannot grow or reproduce in honey. I found this quite surprising, because all things being equal, bacteria love sugar. Honey contains around 40% fructose and 30% glucose—among other sugars—making it seemingly a great treat for microbes. However, honey is also somewhat acidic, and acids prevent the growth of some bacteria. More importantly, honey does not provide the water and oxygen needed to support bacterial growth. Although honey contains a fair amount of water, it’s supersaturated with sugar, meaning the water is not available to the microorganisms. So what happens when you dilute honey with water—the bacteria just multiply like crazy, right? Well…yes and no. Amazingly enough, diluted honey supports the growth of bacteria that are helpful to humans while killing off dangerous strains. Some microorganisms do indeed flourish in a dilute solution of honey—such as the yeast used to ferment it into mead. Also, certain types of beneficial bacteria that live in the human intestines and aid digestion do well in a mixture of honey and water. But honey also contains a substance called glucose oxidase. When combined with water and oxygen, glucose oxidase forms gluconic acid and hydrogen peroxide—the very same stuff you probably have in your medicine cabinet right now. This means that diluted honey can serve as an excellent antiseptic, while being far less likely than ordinary hydrogen peroxide to harm already-damaged tissue. What does all this mean in practical terms? For one thing, it means that honey applied topically to a wound can promote healing just as well as, or in many cases better than, conventional ointments and dressings. Its antibacterial properties prevent infection. It also functions as an anti-inflammatory agent, reducing both swelling and pain. As if that weren’t enough, it even reduces scarring. In studies around the world, honey has been shown to be extraordinarily effective in the treatment of wounds, burns, and surgical incisions. Honey also functions as a moisturizer, making it a useful treatment for sunburn as well as a general-purpose skin softener. But wait, there’s more! Honey is truly a head-to-toe cure. Honey has been shown to be effective in treating inflammation of the eyelid, some types of conjunctivitis, and keratitis (along with other forms of corneal damage). It can also, believe it or not, be used to treat athlete’s foot and other fungal infections. Lest you think that honey is healthy only if used on the outside of the body, it can help with a great many internal problems too. Thanks to its antimicrobial action, it not only soothes sore throats but can also kill the bacteria that sometimes cause them. If functions as a cough suppressant, too. Although research is inconclusive so far, there’s also the suggestion it could actually reduce tooth decay, all that sticky sugar notwithstanding. Moving down the esophagus and through the digestive tract, honey can help to heal ulcers and upset stomachs. It has also been proven to regulate intestinal function, alleviating both constipation and diarrhea. (In a similarly syzygial way, honey can be used both as a sleep aid and to increase alertness.) Honey also contains a variety of antioxidants, which may reduce the risk of cardiovascular disease and cancer. Mānuka honey, made from the flowers of the Manuka bush (Leptospermum scoparium), comes from New Zealand. Some varieties of Mānuka honey contain an antibacterial component called UMF (Unique Mānuka Factor), which has been found to be even more useful than ordinary honey in combating infections. Intriguingly, honey with UMF is even effective against many so-called “superbugs”—strains of bacteria such as Staphylococcus aureus that are resistant to multiple types of antibiotics. Now that you’ve worked yourself into a gleeful frenzy over the miraculous properties of honey, I want to temper your enthusiasm a bit. The bad news, if you can call it that, is that not all honey is created equal. The chemical composition of honey depends on a huge number of variables, the most important of which is the type or types of plant that provided the source nectar. Honeys vary not only in color and flavor, but in their medicinal properties, with some varieties being much more potent than others. Because it’s impossible to regulate the comings and goings of millions of bees, there’s also no way to guarantee that honey from any location will be chemically the same from year to year or free of contamination from pollutants the bees may have found their way into. Honey supplies must be tested thoroughly and regularly. I should mention one other caveat: never feed honey to a child under one year of age. Honey sometimes contains Clostridium botulinum spores. Although they’re inactive in the honey itself, once inside a digestive tract they can multiply and cause a potentially fatal disease of the nervous system called infant botulism. By the time of a child’s first birthday, there are usually enough beneficial bacteria in the digestive tract to make it an inhospitable environment for Clostridium botulinum, meaning that honey can be eaten safely. Alas, honey is not a sufficient remedy for the biggest health problem facing bees themselves: Colony Collapse Disorder, a phenomenon that has resulted in huge percentages of the honeybee population dying year after year. Although pesticides have been widely implicated in Colony Collapse Disorder, numerous other potential causes have also been identified. Whatever the cause(s), however, honey is clearly not the solution. I do hope the bees overcome this problem and flourish—for their own sakes, for the sake of the numerous agricultural products they pollinate, and of course for our honey supply. For humans, at least, honey may be one miracle cure that lives up to the buzz. Note: This is an updated version of an article that originally appeared on Interesting Thing of the Day on June 17, 2004.